Pictured is Rico Berrios, VP of Sales; Tom Hall, Brand Ambassador of the Year; and Veronica Schnitzius, President. 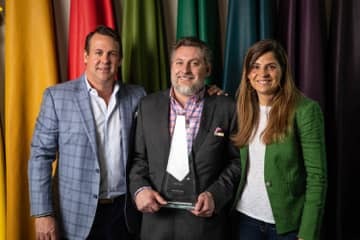 American Leather recently announced Tom Hall as the recipient of the company’s 2018 Brand Ambassador of the Year Award. Hall is American Leather’s sales representative in Michigan, Western Pennsylvania and Ohio. The annual award recognizes the American Leather sales representative who achieves the highest level of growth within their territories, while demonstrating excellence in customer service and leadership. As the newest addition to the brand ambassador team for American Leather, Hall has represented the company for almost four years. According to Rico Berries, VP of Sales, Hall has continuously demonstrated an eagerness to learn and excel in his position with the company. Based in Pittsburgh, Hall brings more than 14 years experience in representing indoor and outdoor lines in the home furnishings industry. Hall was recognized by American Leather during the Spring High Point Market. About American Leather: Founded in 1990, American Leather makes custom-upholstered, premium leather and fabric furniture in its Dallas, Texas, manufacturing facility. Recognized as the industry leader in innovation, American Leather delivers high-quality, made-to-order furniture in three weeks or less to its retailers — a delivery standard approximately three times faster than the industry average. For more information, visit americanleather.com.